Craving for a delicious nail art? The Nykaa Cookie Crumble Nail Enamel Collection is a superior nail lacquer loaded with matte black pigments that deliver intense, long lasting color. Perfect for times when you DO want a fun, instant nail art. This is ultimate collection for girls who wanna have fun! The Nykaa Cookie Crumble Nail Enamel Collection is like wearing tempting crushed cookies on your tips. Nykaa Cookie Crumble Nail Lacquer - 188 Blueberry Shortbread: Our Nykaa Cookie Crumble Nail Lacquer in Blueberry Shortbread is all you want girl! This delicious blue nail lacquer with matte black glitter is surely going to hit that sweet tooth. Resist no more, go ahead and treat yourself. 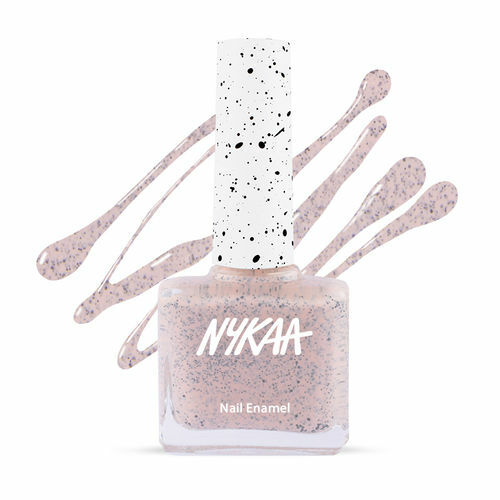 Nykaa Cookie Crumble Nail Lacquer - 189 Mint Choco Chip: Keep it sweet and adventurous with our yummilicious Nykaa Cookie Crumble Nail Lacquer in Mint Choco Chip. This mint green hue speckled with matte black glitter is as refreshing as its coined name. Count us in to devour double batch of these sweet treats! Nykaa Cookie Crumble Nail Lacquer - 190 Cherry Crunch: Our Nykaa Cookie Crumble Nail Lacquer in Cherry Crunch will change your mind and will have running for it again and again! Almost as satisfying as a crunchy pastry, this pink nail lacquer with matte black glitter will surely leave him wanting more! Nykaa Cookie Crumble Nail Lacquer - 191 Gooey Marshmallow: Nothing says a sweet ending like indulging in roasted marshmallow by the fire. Nykaa Cookie Crumble Nail Lacquer in Gooey Marshmallow is a creamy delicacy that will leave your pinkies looking absolutely irresistible! Nykaa Cookie Crumble Nail Lacquer - 192 Vanilla Crisps: Our Nykaa Cookie Crumble Nail Lacquer in Vanilla Crisps is as classic as it gets. If you think you going to pass this sweet treat, better change your mind. This milky white nail lacquer speckled with matte black treat will have you drooling over it! Nykaa Cookie Crumble Nail Lacquer - 193 Frosted Lemon: You don't need to keep it hush, your heart might rush towards our Nykaa Cookie Crumble Nail Lacquer in Frosted Lemon. This delicate yellow shade speckled with matte glitter is as zest as it sounds. Nykaa Cookie Crumble Nail Lacquer - 194 Strawberry Crinkle: Our Nykaa Cookie Crumble Nail Lacquer in Strawberry Crinkle is the perfect mixture of delicious sweetness and a dollop of fun! This light pink shade with speckled matte black glitter is perfect for the girly, girl in you. Why should boys have all the fun, right?! The ultra-fun nail polish formula guarantees a sophisticated look in stroke and a plumping effect in two. The patented two-fold plasticizer prevents chipping. Contains a UV filter to prevent discoloration and yellowing. Now treat your nails with tempting manis that lasts for days and days. The Nykaa Salon Gel Shine Nail Lacquer is FIVE FREE.The Nykaa Cookie Crumble Nail Enamel is NOT tested on animals and contains no animal-derived ingredients. Explore the entire range of Nail Polish available on Nykaa. Shop more Nykaa Cosmetics products here.You can browse through the complete world of Nykaa Cosmetics Nail Polish .Alternatively, you can also find many more products from the Nykaa Cookie Crumble Nail Enamel range.